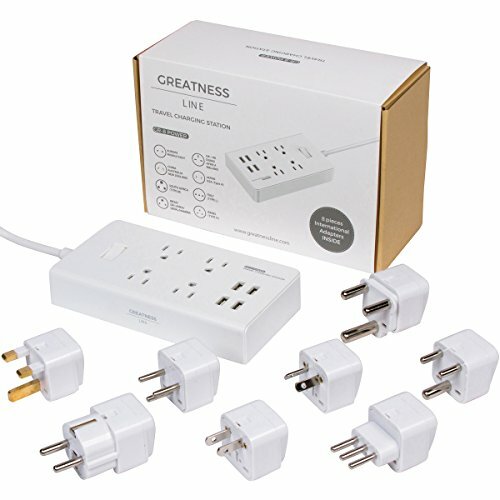 Greatness Line GR-8 Power Compact & Slim Travel Charging Station - International Power Adapter - Surge Protector - Power Strip with 4 Intelligent USB - Free Bonus Included | Replicafer Co.
$29 BONUS FREE INCLUDED: Now with 8 High Quality International Adapters (UK/AU/JP/EU/IN/IT/AF/IS) so you can charge all your electronics with ease on your next adventure or in your Home. Reduce mess and clutter by having a Combo Solution. No to cheap travel adapters! NOT JUST SLIMMER BUT SMARTER: 1.15" super THIN & COMPACT travel charging station, much smaller than any other BULKY competitor and also smarter with 4 Intelligent USB that detects your device most optimal current, be it a smartphone or tablet or Android, Apple iOS, and Windows Mobile Devices. It will always charge it the fastest and safest way possible. No more guessing the type of the USB port. From 1A to 2.4A max individually, up to total 4A combined. 4 AC MULTI-OUTLET WITH SURGE PROTECTOR: Power strip with 4.67' extended Power Cord with Reusable Velcro Organizer. Big gaps between outlets so you can really use all 4 outlets even with bulky adapters. NOT A VOLTAGE CONVERTER. If you have any questions about this product by Greatness Line, contact us by completing and submitting the form below. If you are looking for a specif part number, please include it with your message.